There are almost 24,000 species of butterflies the world. One of the prettiest types of butterflies are the Blue Morpho butterflies. Not only is this beautiful butterfly one of the most sought after by collectors, but also just looking at its metallic-like wings is mesmerizing. While it appears that the Blue Morpho butterfly’s wings are metallic blue, they aren’t – the color is due to how the microscopic scales on the backs of their wings reflect light. "Eyespots" on the underside of a Blue Morpho's wings. The underside of the Blue Morpho’s wings are a dull brown with many different sized ‘eyespots.’ Eyespots serve as a defense mechanism against all sorts of predators like insects and birds. 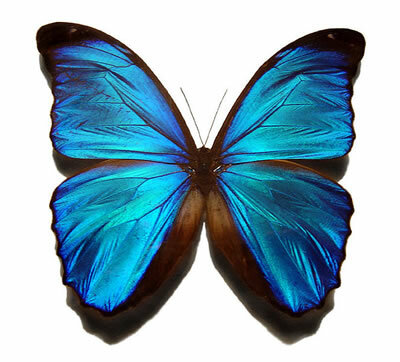 If you get a chance to see a blue morpho butterfly fly, you will notice that the contrasting brilliant blue of the top wings against the dull brown of the underside of the wings almost make it look like the butterfly is appearing and disappearing. This is one way that the butterflies distract their predators. One fun fact about these beautiful butterflies is that they are some of the largest butterflies in the world; their wingspan ranging from five to eight inches easily, which in the butterfly world is huge. Another cool thing to know about these beautiful insects is the fact that Blue Morphos habitat is the tropical forests of Latin America all the way from Mexico to Colombia and the adult Blue Morpho’s usually spend their time on the forest floor or tucked away in the lower shrubs and trees. This is usually where they will rest, their wings folded upward so their brilliant blue is hidden away and they are camouflaged from their predators. 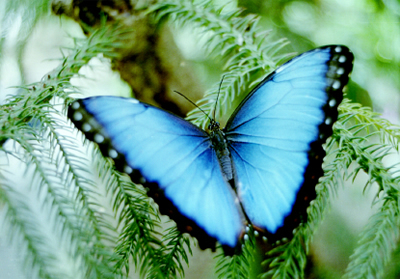 The diet of the Blue Morpho changes throughout their life. As a caterpillar, the Morpho, as many other caterpillars, will chew on the leaves of plants. They particularly like the plants of the pea family. When the caterpillar turns into an adult, their diet changes drastically. The adult Blue Morpho’s can no longer chew and instead they need to drink all of their meals. Blue Morpho’s are one of the many butterflies that besides flower nectar will make rotting fruit juices, the fluids from decomposing animals, fungi, wet mud and tree sap part of their diet. So as you can see, these butterflies are not only beautiful to look at but they are very interesting. If you ever get a chance to see these beautiful insects in action, you should definitely take advantage of it and get some pictures. These butterflies are something else and they deserve to be admired.